In September 2007, I bought the internet name JamesMcGillis.com and began writing this weblog. Since that time, I have posted over two hundred fifteen unique articles. My many subjects include Pre-Puebloan Indian cultures, a Congressional Medal of Honor recipient, LA County Fire Department Aerial Truck 8 and radioactive contamination at the Moab Pile. Each topic was one that I cared about, enjoyed researching and wished to share with the world. When they use text only, blog articles tend to be pedantic and boring. To add unique content to my blog, I began publishing my own photographs. That way, I could tell my stories with both words and pictures. Hoping to catch the eye of readers both young and old, I targeted my content to a ninth grade reading level. Moreover, I continued to write and publish new and unique information. Now, with more than four years of internet experience, I can see the fruit of my labor. Following are a few examples. In September 2007, I attended the Quantum Leap Celebration in Taos, New Mexico. There, 650 Shaumbra (meaning "those who inspire consciousness") arrived at Taos Station in an Old Energy train. Three days later, we pulled away in the new energy express. 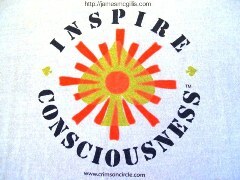 At the event, I purchased an “Inspire Consciousness” t-shirt. After taking a picture of my new energy t-shirt, I published it within an article about that event. If you Google “Inspire Consciousness” today and then click “Images”, my t-shirt has #1 Google search ranking. In November 2007, I wrote about new social networks, which were then taking the internet by storm. At the time, MySpace.com had eighty percent market share, compared to Facebook.com with just over ten percent. Since then, MySpace crashed under the weight of Rupert Murdoch’s ownership. As the epitome of old energy, Rupert could not relate to new media, let alone new energy. MySpace is now an internet afterthought while Facebook is valued at $100 billion. In my 2007 article, I displayed a small Google logo. If you Google “small Google logo” today and then click “Images”, my version has #1 Google search ranking. In March 2008, I wrote about Elton John’s “lost concert”. On September 7, 1973, Elton had played the Hollywood Bowl, yet at that time there were no pictures or video of the concert on the internet. How could the media overlook such a seminal night, I wondered. 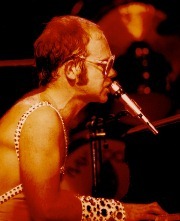 Later, legendary rock & roll photographer Harvey Jordan sent me an image of Elton at the piano that night. With Harvey’s permission, I inserted his picture into my original article. In November 2008, I wrote about my souvenir Elton John Hollywood Bowl t-shirt. If you Google “Elton 1973”, “Elton Hollywood Bowl” or “Elton John t-shirt” today, and then click “Images”, Harvey Jordan’s photo, my article and my t-shirt each has its respective #1 Google search ranking. If you purchase an Elton John 9/7/73 t-shirt, Moab Jim will donate $10 to the Elton John Aids Foundation. In November 2010, I initiated two live webcams in Simi Valley, California, as shone on the website Simicam.com. In December 2011, I wrote about the Ronald Reagan Presidential Library, also in Simi Valley. 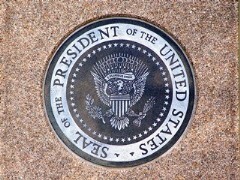 After visiting the library, I published several outdoor images in my article about Ronald Reagan. Today, if you Costantino Proietto (1910 – 1979). At the time, there was scant information on the internet about the artist. After publishing an image of my own C.Proietto masterpiece, friends, family and collectors of C.Proietto’s work came forward. 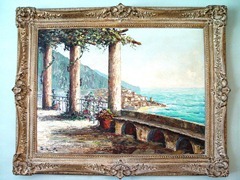 With the help of others, I have now published many previously unknown images of the artist’s work. If you Google “Costantino Proietto” or “C.Proietto” today and then click “Images”, my images of his work have #1 Google search ranking. So what does all of this mean? Google, and to a lesser extent, Microsoft’s Bing search engine will reward new and unique content on the internet. So much content has disappeared from the internet in recent years that my “small Google logo” is the oldest extant copy. The key to success on the internet is to add new information without deleting the old. If you do so, Google will raise the search ranking of all related content. If you plan to write for the internet, rather than using a pay-for-play blog company, consider creating your own blog. By hosting Google AdSense ads on your blog, you can monetize your efforts. When the late Andy Rooney retired from the CBS Television show 60 Minutes, he had broadcast 1097 episodes of his “TV blog”. In order to catch up with Andy Rooney's output, I have 880 articles yet to write. I call that number my stretch goal. Why would anyone create content for Mark Zuckerberg at Facebook to monetize when you can take home the cash yourself? Any ninth-grader reading this article knows the answer to that question.